Contrast pipe trim accentuates the fluttery ruffled shoulders of this flattering knit dress by Shoshanna. Navy knit (83% viscose, 17% polyester). Hourglass. Flutter sleeves. Crew neckline. 35" from shoulder to hemline. Imported. This dress is so gorgeous and feels like a dream on. Classically elegant. Fits perfectly and great length for the office. Sleeves are super fun. Lots of compliments! Can easily dress up with big pearly necklace. Don't pass this one up! I love the sleeve details on this dress. It's body con but not tight- would work well for many occasions. Timeless and trendy. Super flattering! Got lots of compliments on this. Fits snugly, though, so if at all "between" sizes, order up. Since it is knit it shows the bulges you may have. Dress fit nicely. Only concern was length was short especially if you are tall and/or have curves. I love this dress, it's very flattering and playful. I immediately ordered it for myself. Love this dress so much. Considering buying it. It is unbelievably comfortable and super cute. The sleeves are awesome and the length is appropriate for work. Got a million compliments and just felt good wearing this dress. Highly recommend! I got lots of compliments on this dress. This fit really well. It is very comfortable. you could conquer the world on a hot summer day in this dress. it's stretchy, comfortable, cute and figure flattering. the picture looks black, and i never read the directions or i would have seen it's blue. i wore it with strappy shoes to accentuate the white trim. I would dress it up with big white latin style earringsl. i will definately rent this dress again. one of my favorites. I was drawn to this dress and it did not disappoint. The sleeves are really cute and flattering. The shape of the dress is great. The dress is a nice weight of knit, which makes it super comfortable. I did think this L was more like a big M. It hugged my hip area just a little too much. For reference, I'm between a 12 and 10. At 5'7", it was also just right at the "comfortable wearing to work" line. I do wish I could have kept this in my closet. 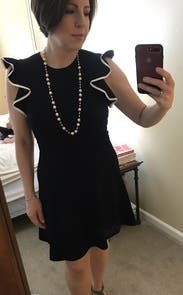 I recently wore this dress to give a work presentation in, and it made me feel polished and fabulous. The sleeves are really cool, but the color and material are conservative enough to save them from being too flashy for a traditional work meeting. 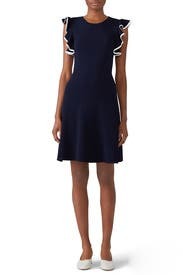 I would definitely recommend this dress. It fit like a dream and helped make me feel super confident that day. I thought it looked weird at first, but ended up loving it. It is form fitting, but the slightly heavy fabric is forgiving, and adds a swing to the skirt. One step dressing. The dress looks clean and polished. I got lots of compliments. Stretchy fabric holds its shape nicely in the arms and is a cute cut. I had a baby and am not insecure about my tummy area. This dress is so form fitting across the stomach that it made me feel a bit exposed so I didn’t wear it. I will definitely rent this dress again. A tad on the short side for work, considering my height, but extremely flattering and comfy! This dress is very form fitting, especially in the waist. It is also quite short. I wouldn't feel comfortable wearing it to work. I didn't wear. I really like almost every Shoshanna dress I've gotten, and in all the other dresses from the brand I fit well into an 8/M. 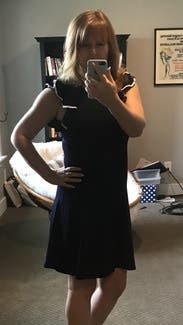 This dress felt very tight to me (beyond just being body con, which it also is) and was fairly short, so I think it runs quite a bit smaller than other dresses from this brand. While the material is nice and thick, it was not flattering and showed every lump, bump, and line underneath (not just VPL, but also the waist of my underwear). I did not feel comfortable wearing it since you could literally see everything underneath. It's too bad because the design of the dress is very cute. The fit was great. Perfect for work or a day out. Too thick of material for summer. Better for spring. Pretty without being fussy. Easy to throw on, yet looked really polished. A classic. knit fabric was very flattering. Color was classic. I would own this dress. Many compliments. Comfortable. Great dress - very figure flattering - the sleeves really make a statement. 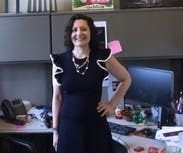 The dress looked a little shorter on me that it appears in picture - but it was very acceptable for the work environment. 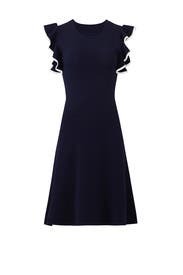 This is a dress that can be worn from day to night - if you have an event after work. WAY too small when ordering my regular size. Would suggest going a size or two up. I got this for a client meeting, and it was perfect. Professional but not stuffy! However, I can confirm what other reviewers have said: runs small! You could see the outline of my ribs without shapewear, even though it's a heavy knit. This was a great fit very flattering great color I love this! Great dress. Fit perfectly!! I received so many compliments!!! Great fit and sooo comfortable! I usually change to PJs as soon as I get home for work, but this dress was so comfortable, I didn't realize I still had it on for 2 more hours until my fiance mentioned it!! This was a super comfortable dress. However it shows every lump and bump. I am very top heavy and felt super self conscious in how it clung. It made me wish I owned stand for the tummy area too. I didn't like that the hem rolled up (knit) and the ruffles. They weren't as perky as they should have been. It's a classy dress and would look great on a bit slimmer girl. This dress is really attractive, and I received a ton of compliments all day. It does run very small through the bodice, which was tight on me (and my small chest). It wasn't so tight that I couldn't wear it, but I did double check that I hadn't ordered a size small. The knit material did have a tendency to curl up a little, as well, but this was not a real big issue for me. Love it & thinking about buying it! Looked great on me and was extremely comfortable since the dress has stretch to it. I'd rent it again ! love the length, the flower sleeves are really cute. suggestion for normal& big size ladies, order one size up. will feel better on the waist. Love how it looks on you! 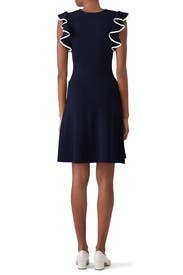 This dress has a nice stretch and looks like Tennis dress when on. Always got complements when I wore it. It's a fun dress to wear. Very comfortable and sleeves make it something different in little black dress. I wore this for my baby shower and received many compliments. The fabric is stretchy and comfortable and the style is super cute! 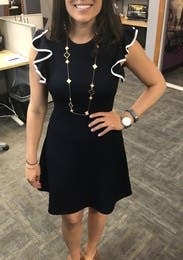 I wore this dress a number of times to work. 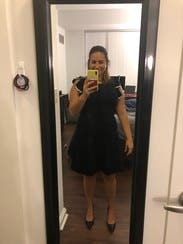 This dress has a great fit, and I received a ton of compliments when wearing it. It's very comfortable as well. Also, a great transition dress for the first two trimesters of pregnancy. It's a very tight fit so good to show your figure. I loved it!! !